Ultimate toys and tools of 21th century. Drones are known to some as relatively expensive. Many people even believe that they are an impractical purchase because they are easy to break. While that may be true in some cases, there are plenty of drones for sale that are inexpensive, sturdy, and flexible. One of the most frequently asked questions regarding drones is which ones are the cheapest, and this article answers that question. First on the list is the Hubsan X4 (H107L). It’s as cheap as quality drones can go. This small yet durable drone is highly recommended for beginners and kids. 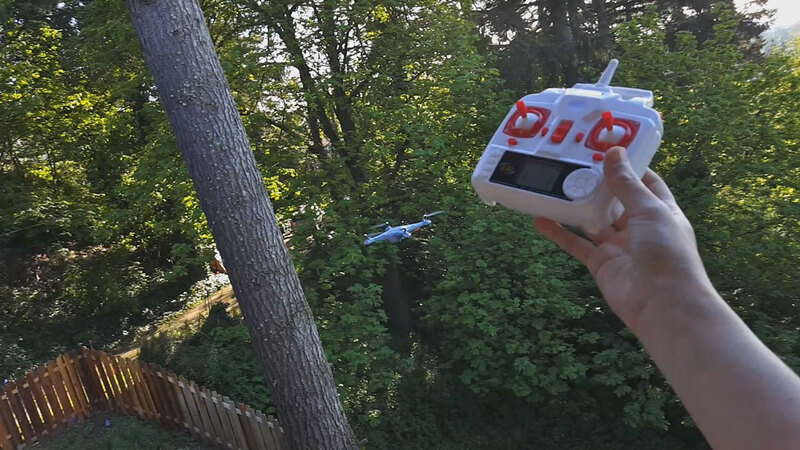 In fact, it’s one of the most popular drones for kids available on the market. It is best used for indoor training, and can fly for about 10 minutes with a control distance of about 30 meters. 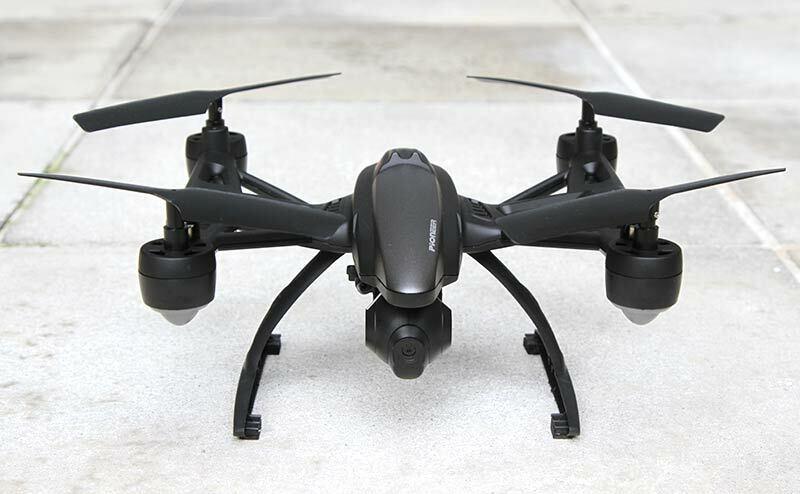 Its lack of a camera is redeemed by its excellent features and flying quality— it can be fast and easy to maneuver (for drone races) or move at a slow and leisurely pace (for practice). For nighttime use, 4 LED lights are attached near the rotor blades. These can be turned on or off anytime. Protection covers can be added to shield the rotor blades from impact when falling upside down or colliding with other objects and surfaces. For protection underneath, soft pads are located under the drone to increase resistance in unexpected crashes and collisions. Hi-tech composite plastic is used to enhance durability and crash resistance. 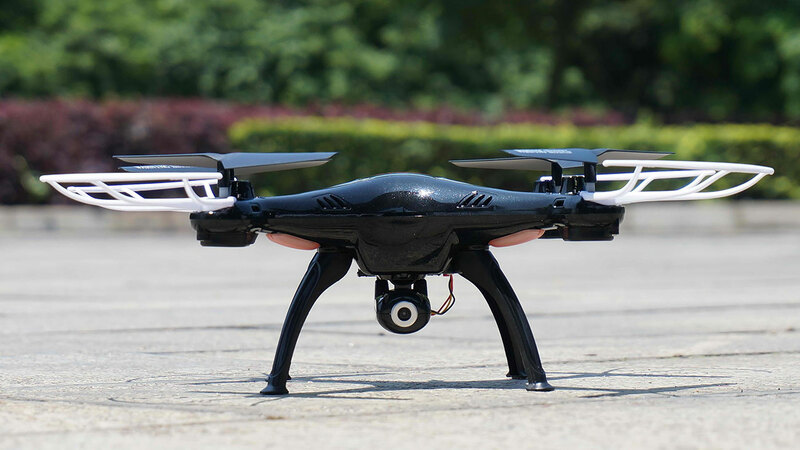 Second is the UTO Drone U960 Hexacopter, one of the cheapest hexacopters in the market. It’s a bit more costly than the Hubsan X4 (H107L), but for good reason. This drone includes an HD camera, 6 blades as the name suggests, and a control distance of about 100 meters. It’s capable of real-time video streaming via wifi, with first person view that works with an app. This can be used for a multitude of work and recreation-related purposes. Comes with 6 movable rotor blades to maximize control accuracy. It has an adjustable gyroscope, preventing instability and crashes. Can do 360 degree rolls for cool camera tricks and effects. Keep in mind that these are but a few of the many cheap drones in the market. If you are interested in buying a drone, ample research is recommended to ensure that you are satisfied with your purchase. Today we will bring you a list of 10 best quadcopter that can be found for under $100.You will see, many good and quality drones are avaliable for low price. Last place on our list goes to FY326.It is cheapest drone in list and its best side is control distance of 150 meters.Engines produce enough power even to lift up a small camera.It comes with prop guards and landing legs so flight and landing should be safe.Flight time is 10 minutes. F803C is one of the most interesting micro quadcopters.It has amazing 100 meters range and it comes with 1MP camera which is built into a quad.This drone is perfect for indoor flights but you can take it outside when you are sure that is not windy.Design in another good thing at this drone,LED lights and painted propellers give it a cool look. Syma X5C1 is upgraded version of X5C, one of Syma’s best and most selled products.It is ready-to-fly and comes with camera.Four motors are powerful enough to put this drone with camera in the air, but if you move camera it can transport small and light objects.Flight time is couple minutes when camera is used, but Syma X5C1 can flight 8 to 10 minutes when camera is OFF.This is one of the cheapest drone that comes with camera. DM007 is one of the best looking quadcopters.Designers really give good efort on this drone.Futuristic look and black color earned it the name of „spy“ drone.It is small drone but it comes with 2MP camera and you need to practice a little bit to become able maneuvre it.With camera control distance is 70 meters but without camera distance increase up to 300 meters.Flight time is 10 minutes which is really good for such a small drone. 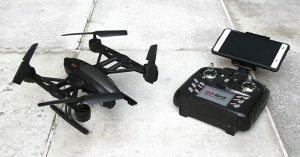 First drone on our list that comes with FPV(First person view) Real Time Transmission.This is posible using a WiFi FPV camera 0.3 MP that connects to your IOS or android using an app.This app enable you to see what X400 is recording in real time.It has powerful baterry which allows it to fly 8-10 minutes. Another Syma product, they target market are low-cost drones.X8C is large quadcopter and comes with upgraded camera.It is really heavy, over half a kilo so you need to be careful not to crash it.Baterry and motors are powerful, just as every large and heavy drone should have.This power allow it to fly 200 meters in distance for 12 minutes. X250-B is an upgraded version of Alien X250 with FPV.It has a little different design than we used to see.It comes with a 2MP camera.Fpv transmission is done through IOS or android app just like as MJX X400.App can also functionate as remote control, but you can control it through regular RC remote.Flight time is between 10 and 12 minutes and control distance is solid 150-250 meters. Third place on our list is reserved for Pioneer JXD 509V, quadcopter which besides its main function have many useful features for great price.It includes: One-Key Return, Altitude holder, Headless mode.2MP camera can tilt for 30º, allowing different points of view.Only weak side is control distance which is only 80 meters, but all in all this is one of the best low-budget quads. 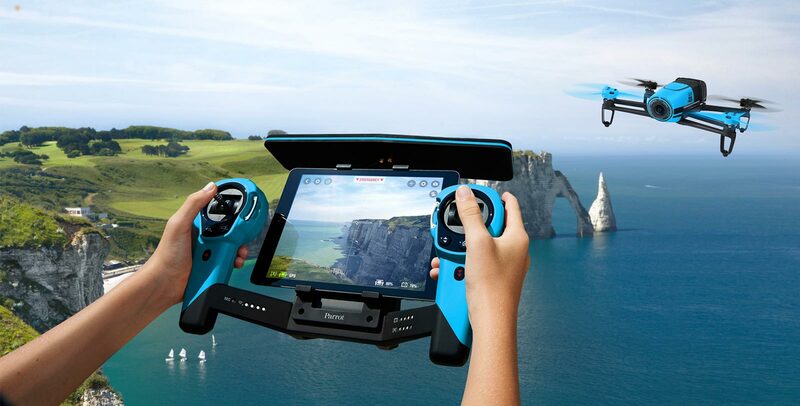 JJRC and Syma are top producers of low-budget quality drones.H26W comes with 2MP camera with a 2 axis adjustable gimbal, which allows you different recording angle.FPV is, like in previous cases done through app that can be downloaded on your android or IOS.It also comes with two very useful features:Headless mode and One-Key return.At the end, control distance is outstanding 300 meters! 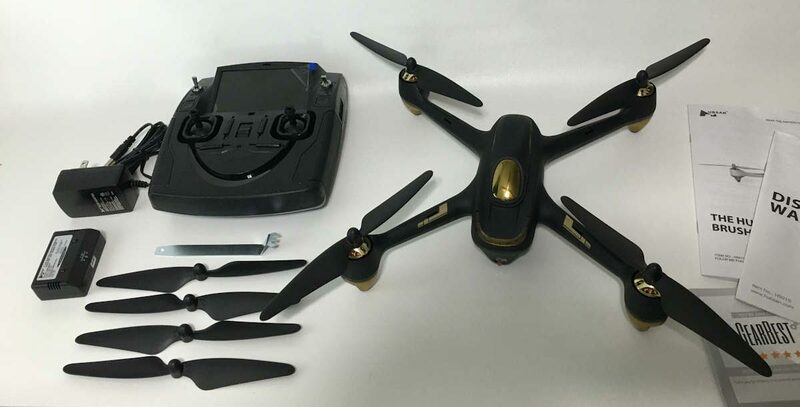 1st place on our list goes to JXD 509W, an upgraded version of 509G.This is WiFi version of 509G.It is made from plastic and propellers are flexible for 90º, so you can be sure that crashing it or hitting some other object would not do big damage on it.Many features comes with it.Altitude holder, One-Key return, Headless mode, Automatic landing.Do you agree with me that there is no better drone for $100? 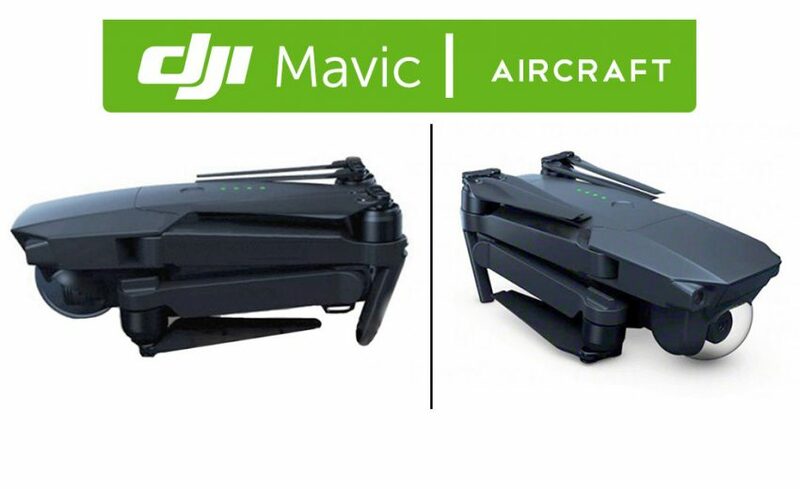 DJI Mavic – newest drone from most popular drone manufacturer. Only few days after GoPro Karma was announced, DJI announced Mavic. Before we start talking about specifications, features.. I’d like to ask you something. We already had advanced drones available on the market, with good camera, features, specs. But, there’s one thing that was missing. Can you name it? In my opinion, it was portability. Drones, especially high-end drones were large and hard to transport. Have you ever seen DJI Inspire 1 for an example? On images it doesn’t look that large but when you see it in real then you realise how big that drone is. You can’t bring it with you when you’re going on weekend trip. You need car to bring it from place A to place B. It’s time for new era of drones. High end portable drones are the future. Let’s don’t lie ourselves. This trend started way before DJI decided to build portable drone. We already had GoPro Karma, AirDog and few other portable drones. But DJI, thanks to name they have, is able to change things overnight. It’s question of time when we’ll start seeing portable drones in cheap drone segment. Despite it’s small size, Mavic comes close to beating DJI Phantoms 4 specs. DJI Mavic has top speed of 40mph, compared to DJI Phantom 4 45 mph, that’s 5mpg slower. That’s definitely not big deal and shouldn’t be deal breaker. When it comes to flight time, things are very similar on both Mavic and Phantom 4. Both of them can achieve 22minutes of flight time in average. Maximum flight time is claimed to be 27 minutes. Now, what’s interesting is control range. DJI claims that Mavic has a control range of over 7 kilometers. That’s almost 2 kilometers more than DJI Phantom 4. This hasn’t be tested yet so we can’t comfirm it with 100% sure. Now, I guess you’re wondering how does Mavic flies? Well, from what we know for now it’s very good flyer. I guess it’s because of its size. It’s significantly smaller that Phantom 4 and that makes it much more wind resistant. Again, we’ll have to test this to be 100% sure. For now, we’re only talking about DJIs claims. So, what do you think about DJI Mavic so far? Do you think it’s better than GoPro Karma? Do you prefer Mavic or Phantom 4? Do you have an idea what’s the best drone under $100? 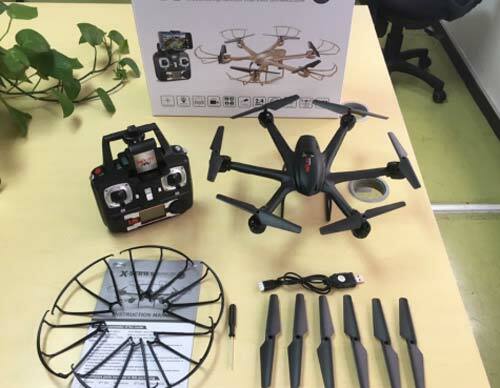 Finding out what is best drone you can find under $100 is interesting task, because there are many good drones for cheap price.As drones become more and more popular, most of companies in drone business launch their version of low-budget drones. For these cheap drones we could not expect to have best features in world, but some of them have some performances that even the best one would not be ashamed. Best drone under $100 at this moment is JXD 509W, which is a WiFi version of JXD 509.